What do you do when playing a three-bet pot from out of position with -offsuit and you miss the flop entirely? Mike “Timex” McDonald has some ideas, and he shared them with Kristy Arnett — one of a number of topics the pair discussed on the most recent “Strategy With Kristy” podcast. McDonald is enjoying an especially hot start to 2014 after enjoying deep runs in both the 2014 PokerStars Caribbean Adventure Super High Roller in which he finished eighth and the 2014 PCA Main Event where he finished runner-up to Dominik Panka for a whopping $1,064,865 score. To those performances McDonald added a third-place finish in the 2014 Aussie Millions $100,000 Challenge to earn another $1.7 million-plus USD, thus positioning himself in fourth place currently in the Global Poker Index Player of the Year race. 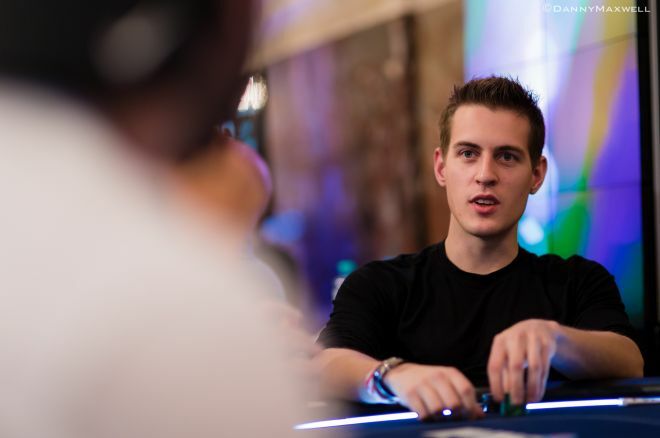 As McDonald explained to Kristy, however, he still considers himself more of an online player than live, having only played a handful of events prior to EPT Vienna. The Canadian pro focuses especially on the Sunday majors, playing all of the big ones 40-45 Sundays a year, and just recently earned another nice finish in the PokerStars $109 Sunday Rebuy ($225K Guaranteed) in which he topped a field of 998 to win. It was at the final table of that tournament where McDonald played an interesting hand against another top online player, Laurynas “LaurisL91” Levinskas of Lithuania, a hand which McDonald analyzed at length with Kristy. The nine-handed final table had just begun, with the blinds 12,500/25,000 with a 2,500 ante and the average stacks about 780,000 (about 31 big blinds.). A hand arose that saw a player open with a raise to 50,000 from the hijack seat, then McDonald reraised to about 130,000 from the small bind with -offsuit (with no spades). Levinskas then cold-called McDonald’s bet from the big blind, and after the original raiser folded the flop came with two spades. It was not such a great flop for McDonald’s hand. He checked, then watched “Lauris91” make a small bet of about one-third of the pot. What would you do in such a spot? Find out what “Timex” did by listening to his breakdown of the hand and situation, starting around the 16-minute mark, including how Levinskas’s preflop action helped him establish a range for his possible holdings that helped him decide how to play after the flop.